A visit to Rome is one of the absolute highlights of a trip to Europe. Experience the more than 2000 years of history with the Coliseum and the Roman Forum. Explore «the Eternal City». 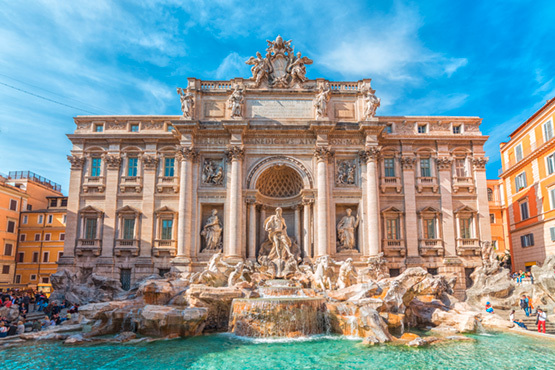 Vatican, Roman Forum, the Trevi Fountain, everywhere the eyes are pampered with history and art. Speaking of pampering: Browse through the lively markets and enjoy an aperitif in Trastevere. Choose one of three packages and add ground services as you like. Go as you please and discover Rome at your own pace. You are able to get on and off the bus as you like. Multilingual audio tape commentary (incl. English). Daily. Rome - Airport Fiumicino – hotel or vice versa. Private taxi 1-3 persons or Executive car 1-3 persons or minibus 3-5 persons and 5-8 persons.